Starting a new business always has its risks and when and where you launch your venture can have a real impact on your success. Luckily for you, if you have always wanted to own a food truck, this spring is the perfect time to make a food truck investment in Philadelphia. Check out these 6 reasons to make a food truck investment in Philadelphia this spring. According to experts, the size of the food truck industry as whole is estimated to grow by nearly 20% in 2019 and Philadelphia in particular is seeing a real boom in food truck businesses. So now is the perfect time to get your food truck started. Why the spring you might be asking. Well, we all know that when the weather starts to warm up in the spring we all love to be outside more and will be looking for more outdoor eating options. A busy spring is the perfect time to launch your food truck business because you will hit the ground running. Choosing to open a food truck is also a more affordable option because the initial investment required is a lot less than it would be for a brick and mortar business. The food truck industry, especially in Philadelphia, is very diverse which means any one can truly become a food truck owner. From military vets to immigrants, food truck owners come from all walks of life. Today more and more people are living a mobile lifestyle, always on the go, looking for quick, but well-made and diverse food choices. This opens up the market for such diverse types of food truck investments that you are sure to easily find your niche. 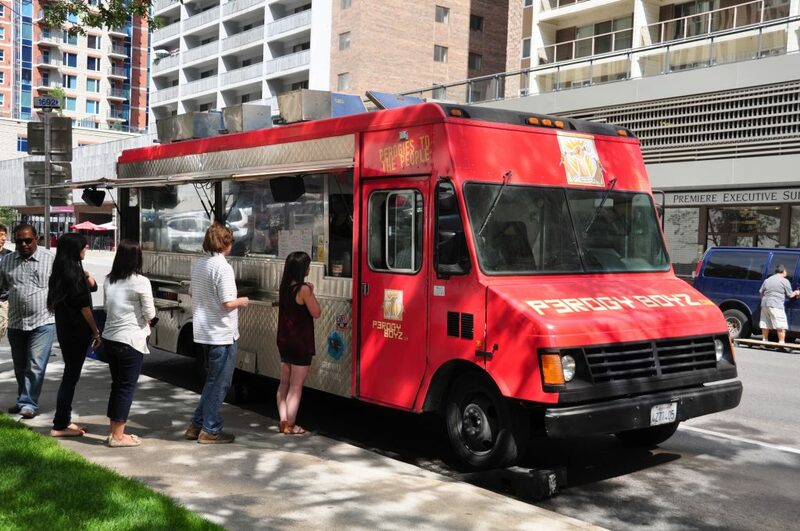 Another great reason to make a food truck investment in Philadelphia this spring is because there are also plenty of creative ways to increase your revenue with it. One way to drum up more business is to offer gift certificates to your truck as a great corporate gift. If you are a favorite lunch spot for certain businesses, employees there would love to receive a gift certificate from your truck from their boss. Advertise your gift certificates as perfect for personal gift giving too. Your regular customers will love it if their loved ones surprises them with one of your gift certificates. And while catering big events like weddings and birthday parties are great, don’t discount the opportunities pre- and post-celebrations can also bring. During celebrations there is always room for extra grub and drink before and after the main festivities to keep the part going longer. Think also about adding amateur sporting events to your regular food truck stops. Working up a sweat whether on the field or in the stands cheering is thirsty and hungry work. Form relationships with local sports organizations so you can get a prime spot. All types of community events are also creative ways to make money with a food truck. Form strong relationships in the different communities that you serve with your food truck and you will be amazed at all the possible opportunities that will be presented to you. Think also about partnering with brewery startups. Combined together you will be able to offer customers both good food and good drink. There are a lot of food trucks for sale in the Philadelphia market. Many burger franchisors are getting into the burger food truck business so now you can own a food truck from your favorite burger franchise. By joining a franchise, you have the security of offering the food of an established brand that people love already. Also most burger franchisors like Zac’s Burgers will offer support on how to start a food truck which will be indispensable to those who are new to the food truck and restaurant businesses. When you buy a burger truck from a franchisor like Zac’s Burgers who has locations in Philadelphia and the Delaware Valley, not only do you get a preset menu but you can also take advantage of their brand power. Zac’s Burgers is known for being a family-owned business that treats its customers like family. They pride themselves on delicious made-to-order meals and friendly service at a reasonable price. All the food is made fresh with the highest quality ingredients and with unique twists like wacky zacky sauce. Zac’s Burgers menu includes different types of burgers (hamburgers, cheeseburgers, bacon hamburgers, bacon cheeseburger, bacon mozzarella cheeseburgers, mushroom and swiss burgers, Zac’s double burger with cheese and veggie burgers. Zac’s also offers wings, chicken sandwiches (fried, grilled, buffalo fried, buffalo grilled, grilled chicken caesar), flounder sandwich, crab cake sandwich, hot dog and hot sausage sandwich. The menu is pretty expansive. As a Zac’s Burger food truck, you can also sell other burger joint favorites like chicken fingers, French fries, waffle fries, sweet potato fries, onion rings, mozzarella sticks and thick hand-dipped milkshakes. At Zac’s, we are currently looking for new franchisees to join our food truck program. When you license a Zac’s Burger Bus not only do you get to be your own boss, but you get to enjoy low startup costs and minimal operating expenses. We will provide you with a proven business model for success and two weeks paid, personalized training as well as ongoing business support. We are dedicated to giving you all the proper foundation to be a success. Other advantages include access to a commissary and free product to promote your new business. For more information on why you should make a food truck investment in Philadelphia this spring and how to get started with Zac’s Burger Bus, give is a call or send us a message today.